If you use Fuze for Chrome, you can easily add Fuze meetings to your calendar invites. When you’re scheduling a meeting in Google Calendar, simply click the Add Fuze Meeting button that appears in the Event Details pane. This automatically creates a Fuze Meeting and places the meeting details in the body of your invite. You can also use the adjacent New Meeting ID drop-down list to create a new meeting ID for the meeting, or use a vanity link for your meeting. The Fuze Meetings setting in your Fuze for Chrome setting must be enabled to use this feature. When you send the meeting invite, invitees to easily view the Fuze Meeting details, and even click a link in the invite to join the meeting. 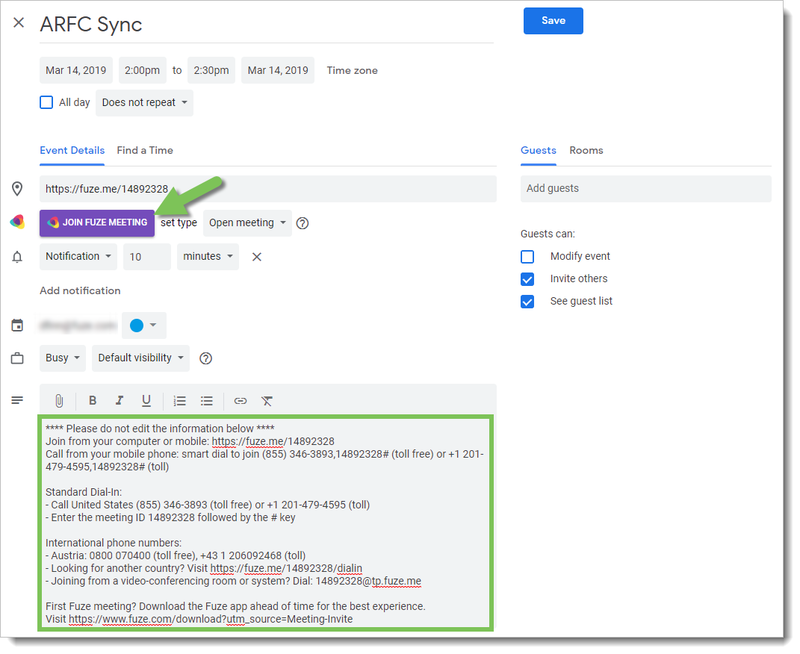 After you have scheduled your meeting, you can also open the invite and click Join Fuze Meeting, and you can update the type of Fuze meeting via the Set Type drop-down list. See the following article for details about how to join a meeting from a calendar invite.